A mesh office chair that will automatically adjust to you. The MS4000 office chair is designed with an auto adjusting mechanism that uses your own body weight to recline back with out the need of multiple levers. 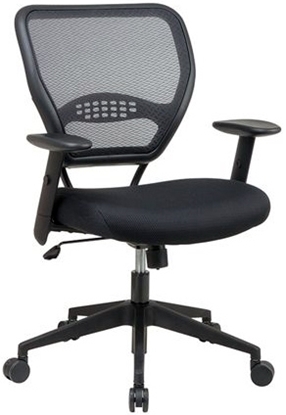 A high back mesh chair with headrest that looks great with an executive desk. 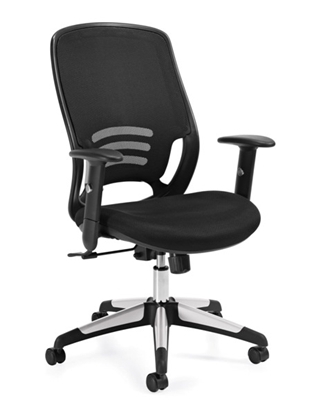 Features a thick padded contoured fabric seat, mesh back with lumbar support, pneumatic seat height adjustment and headrest. Perfect for a home office or corporate workspace. A great addition to any office, this mesh office chair features a flexible mesh back, adjustable height lumbar support, and a padded foam fabric seat. This chair can be used in almost any office setting including conference rooms, private offices, and communal work areas. Order today and get free shipping! 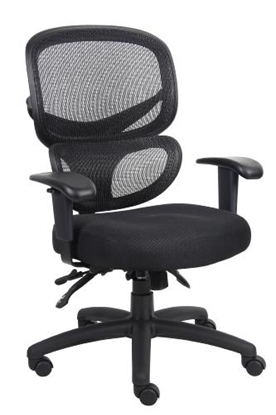 A mesh back office chair that is a great fit for the home or business. 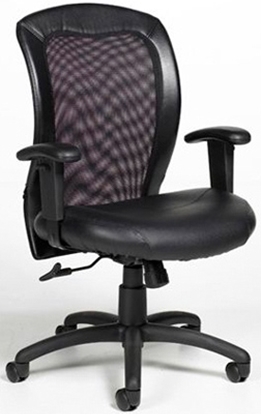 This chair features ratchet back height adjustment, 2-to-1 synchro tilt adjustment, and tilt tension adjustment knob. Order today and get free shipping! 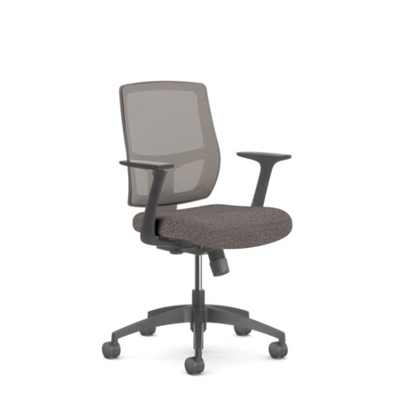 A great addition to any office or conference room, this mesh chair features adjustable t-pad arms, breathable mesh back, and pneumatic seat height adjustment. Sit comfortably while working with this mesh office chair. 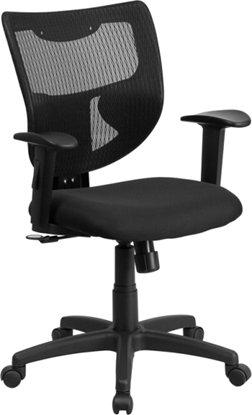 This mesh chair features height adjustable arm rests, pneumatic seat height adjustment, and synchro-tilt chair control with infinite position tilt lock. 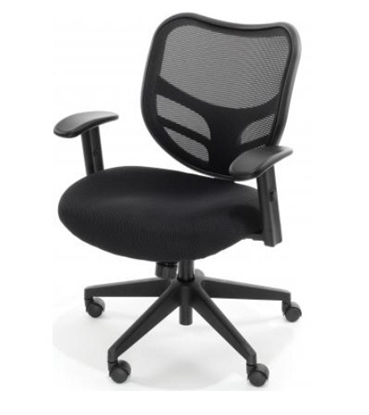 This Offices to Go mesh office chair is attractive, supportive, breathable and includes a mesh back and fabric seat. 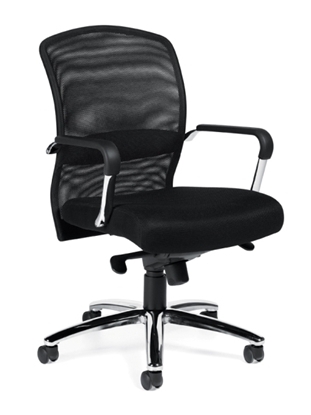 Features polished chrome arms with polyurethane armrests and a pneumatic seat height adjustment. The rolled back design sets this chair apart. 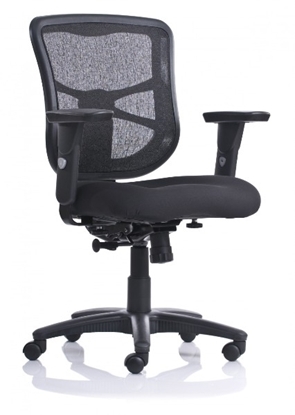 The Office Star 5500 mesh chair features adjustable angled arms, angled base and oversized carpet casters. Its 2-to-1 synchro tilt mechanism allows the user to recline while keeping seat cushion relatively level to floor, so you can maintain eye contact with your guest and computer monitor. Warranty and free shipping on all furniture. 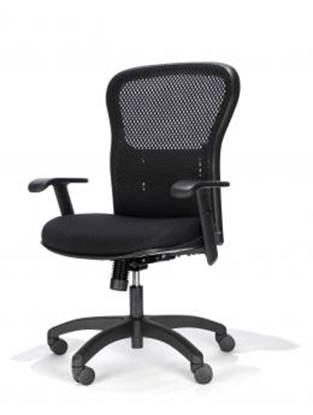 The Capri mesh task chair is the ideal seating choice for conference rooms, executive desks or a home office. Moves effortlessly, almost sensing your next move. A very comfortable chair, this model adjusts to fit your body. With its distinctive high impact mesh back, the Essential Series provides high style and versatility. All models feature an enhanced lumbar system to support virtually all back shapes and sizes. This weight sensing synchro-tilt chair from OTG with multiple other ergonomic features will make you comfortable in your office! 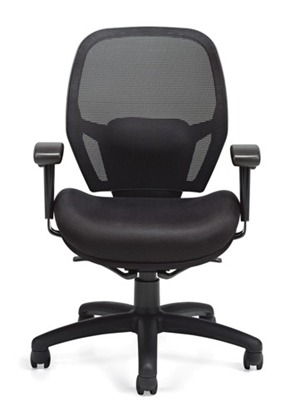 A mesh chair that is designed to provides exceptional back support. 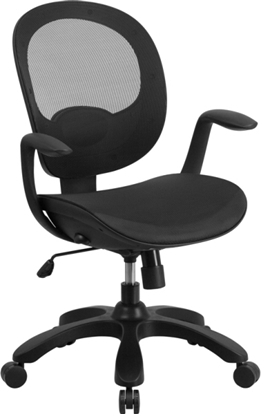 This mesh chair also features ratchet back adjustment with active lumbar support, a 3 paddle multi-function tilting mechanism, and adjustable tilt tension control. 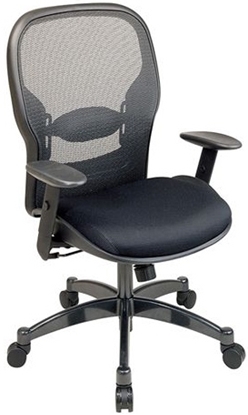 A standard sized Mesh chair with a higher than standard 300lbs weight capacity. 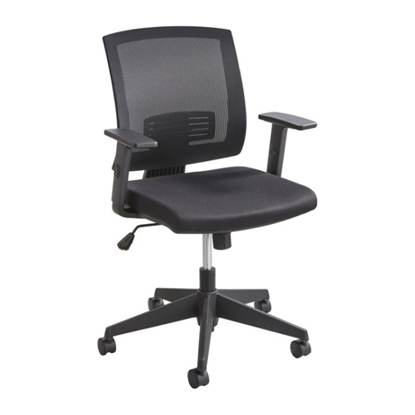 The RFM 161Q is constructed with an adjustable lumbar support and height adjustable arms. This Ultra Mesh Mid Back Task Chair in the Milan Series from Enwork features an airfresh black elastomeric mesh back and molded foam black fabric seat. 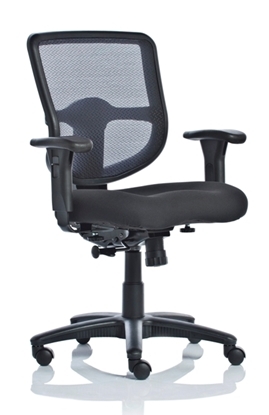 This chair offers a ratchet back height adjustment, tilt tension control and more. A mesh chair that can be used in any office setting, from private offices, to conference rooms, and even cubicles. 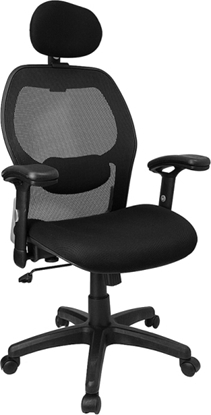 This chair features pneumatic seat height adjustment, height adjustable arms, forward tilt control, and adjustable lumbar support. A versatile chair that can be used in offices, cubicles, conference rooms, and just about anywhere a task chair is needed. This chair features a mesh back, molded seat foam, and a synchro tilt mechanism. 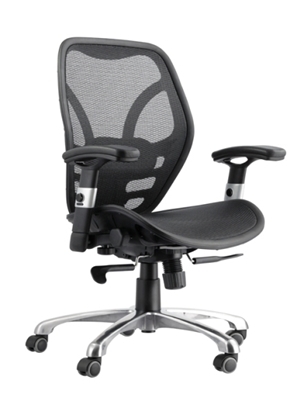 Thick padded contour seat and Matrex back with adjustable lumbar support make the Office Star 2300 mesh office chair very comfortable. It's 2-to-1 synchro tilt mechanism allows you to maintain eye contact with your guest or your computer screen while reclining. Perfect for a home office, conference room, or executive workspace. Free shipping and warranty available on all furniture. Order today!